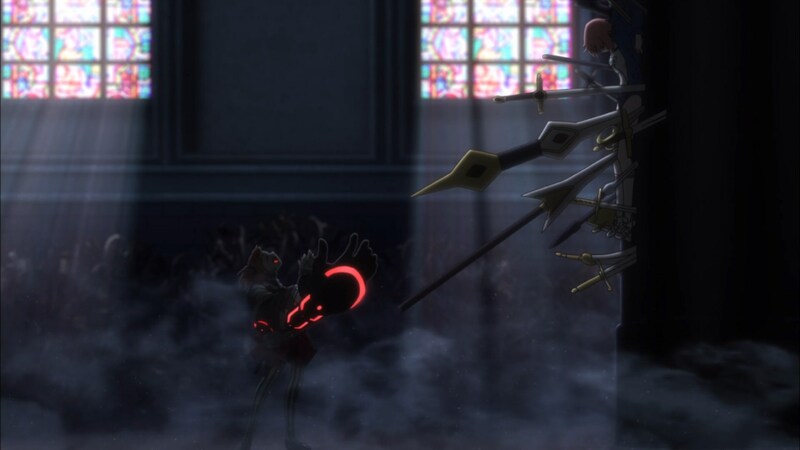 Angelica, having the Gilgamesh Archer Card installed, attacks, only to have all of the weapons used taken by Gil. 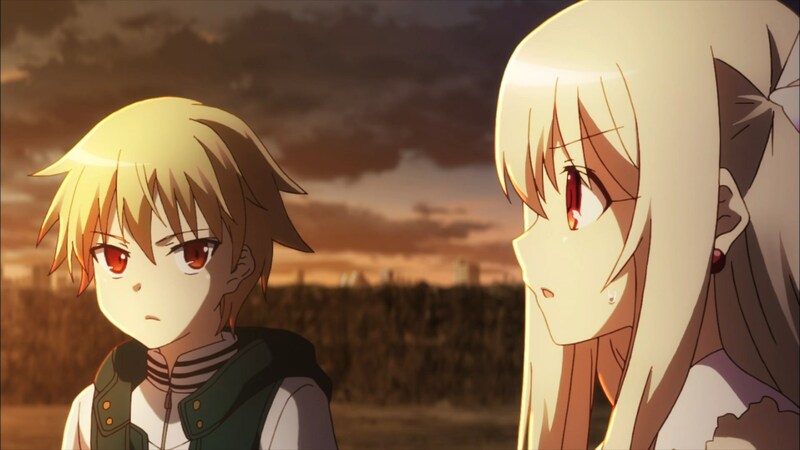 Angelica comes to understand whom her opponent is, but is interrupted by Ilya, who only wants to know where Miyu is. 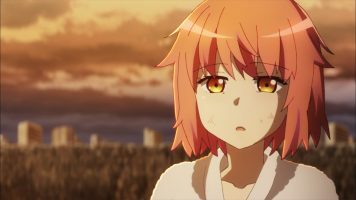 Shirou reveals the location and is punished as a result. Gil gives Ilya and Tanaka Vimana a magic cloth and sends them to go get Miyu. The two enter a large door, only to find there’s no floor and they fall down a mountain of trash metal. At the bottom, they are greeted by Beatrice. After some words of greeting, Beatrice attacks Tanaka, but is surprised when Tanaka isn’t torn apart. 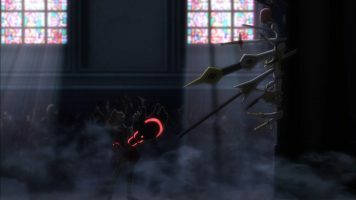 Beatrice attacks with the blades all over, pinning Tanaka to a pillar, but not breaking her skin. Tanaka pleas about not feeling good cause Ilya to grab a club to attack Beatrice. To Ilya’s surprise, it is Ruby, allowing Ilya to transform into a magic girl. 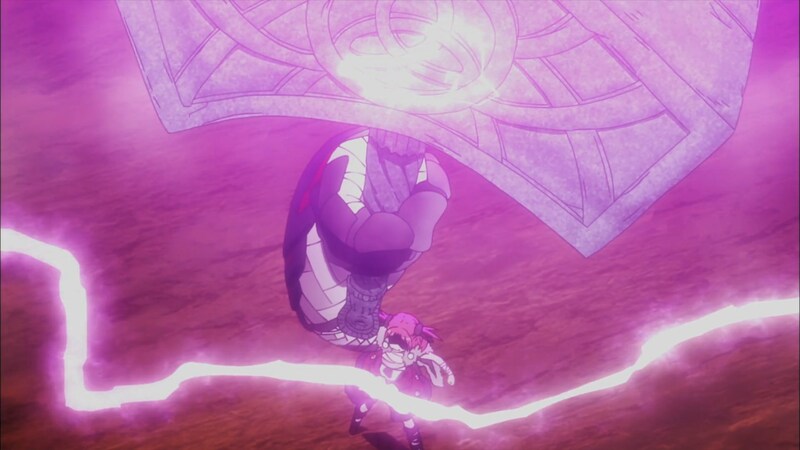 However, Ilya’s attacks don’t phase Beatrice. As such, Ilya installs the Caster card, becoming Caster and using Caster’s abilities. Beatrice is able to counter Ilya-Caster. 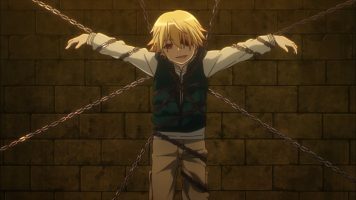 Back at the jail cells, Angelica has Gil chained to the wall with Enkidu, but he soon takes possession of that weapon and more. 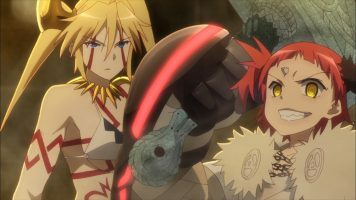 However, Angelica has other tricks, meaning Gil can’t win the fight. The battle between Ilya and Beatrice bursts through to the jail area. Gil tells them they have to flee, which they do. However, Beatrice and Angelica soon catch them since they don’t have Vimana the magic cloth. Ruby tells Ilya that Beatrice’s power is too much for them. A sniper arrow stops Beatrice, who gets angry. However, the voice of Darius Ainsworth orders Angelica and Beatrice to stand down. After greeting Ilya, Darius has his servants return home. In the distance, Kuro and Bazett have been observing and depart to meet Ilya and company. I rather enjoyed Gil’s battle with Angelica. On one hand, he’s trolling her to regain his treasures. He lets her give him a beating, simply so he can take Enkidu from her. I actually chuckled at that. On the other hand, Angelica is still too much for Gil to handle, especially since she had some other cards. The Ainsworth have to have multiple Class Cards to summon various Archers, Sabers, Casters, etc. That raises the question of why Miyu didn’t seem to know about that? I’m glad to see that my thinking Beatrice might be wielding Mjölnir was proven correct. It is hard for me to see Thor as a Berserker Class Heroic Spirit though. I wonder if there is a tale about this that we will eventually learn. As much as I am glad to see Ruby return so that Ilya can fight, having Ruby show up as a wrapped piece of trash in a massive trash pile is a bit too convenient. I couldn’t understand how Ilya got separated from Ruby in the first place. Now, Ruby shows up just when Ilya needed her most. Hopefully, there’s an explanation for this because I don’t car much for convenient moments like this. I like seeing Ilya as Caster from Fate/stay night. 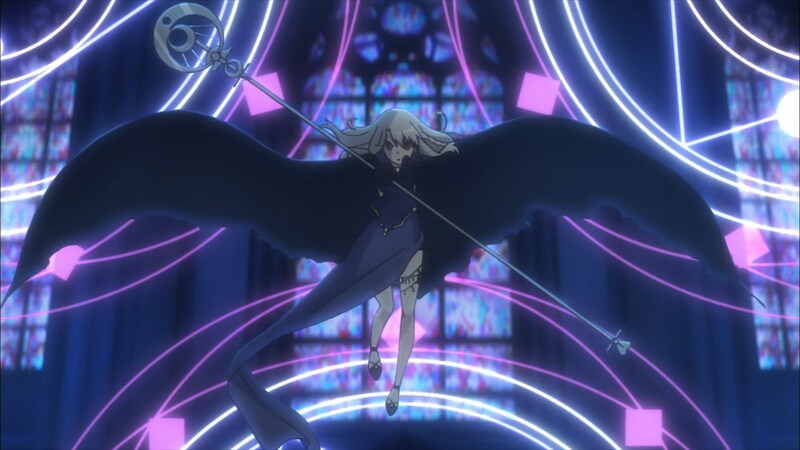 I’m guessing that by doing a full install of the Caster Class Card, Ilya understood how to use Caster’s powers. Otherwise, I’m not sure how Ilya could have known what to do as Caster. Initially, I thought I would condemn the second lucky escape by Ilya and company, whereby Beatrice is stopped before landing a killing blow. 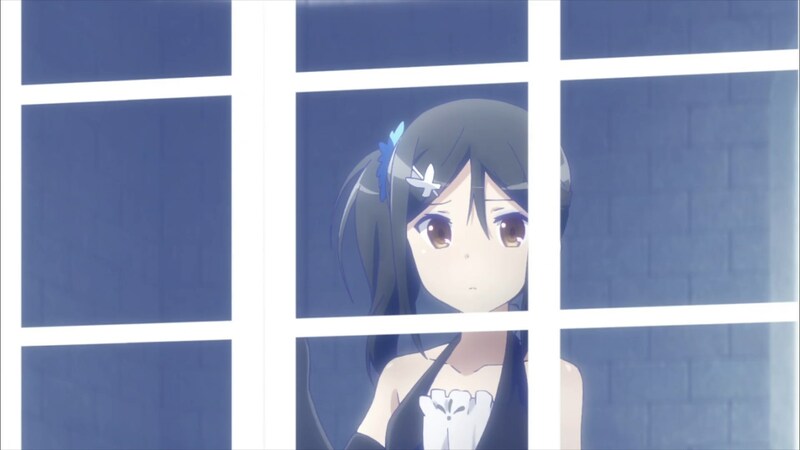 However, upon watching the episode a second time, I came to realize something. Considering the respectful way Darius Ainsworth spoke to Ilya, I’m thinking he recognizes Ilya as a Grail like Miyu. As such, he might not wish to harm her. If that’s the case, then it makes sense for him to order Beatrice and Angelica to stand down. Then there’s Tanaka. In the last episode, I kept expecting her to reveal that she has some kind of impressive ability. After all, she proclaimed that she’s to destroy the Ainsworth, even if she doesn’t remember more than that. Well, we got to see her become a literal human shield. The fact that her skin couldn’t be broken made me think of Luke Cage (a Marvel comic book character). It also made me think of Karin from UQ Holder. While Tanaka has been comedy gold in the first two episodes, she became a tragic character in this episode. She might be able to take insane amounts of damage, but because she’s a naive, innocent girl who’s lost her memories, her pleas to Ilya about not feeling good because of the beating she took from Beatrice hit me hard. 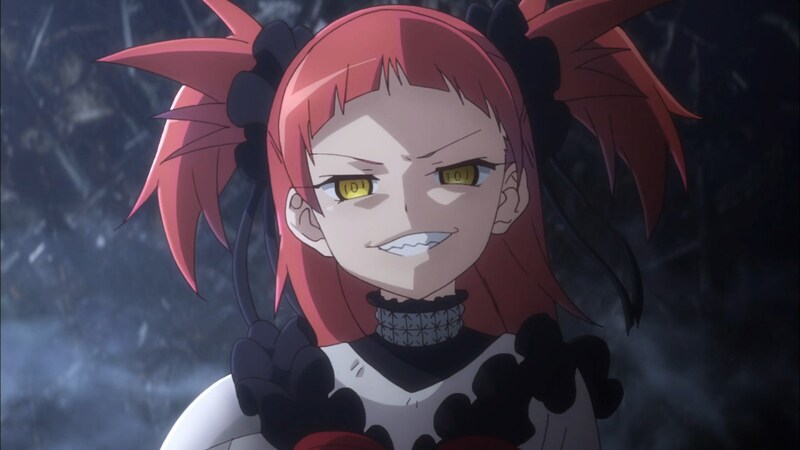 I just know that Tanaka is going to prove to be some kind of weapon of some sort, so I hope she can get some revenge on Beatrice. Glad to see Miyu here. However, it is sad to see the princess trapped in a gilded cage. Making it sadder is the fact that Ilya is forced to retreat. 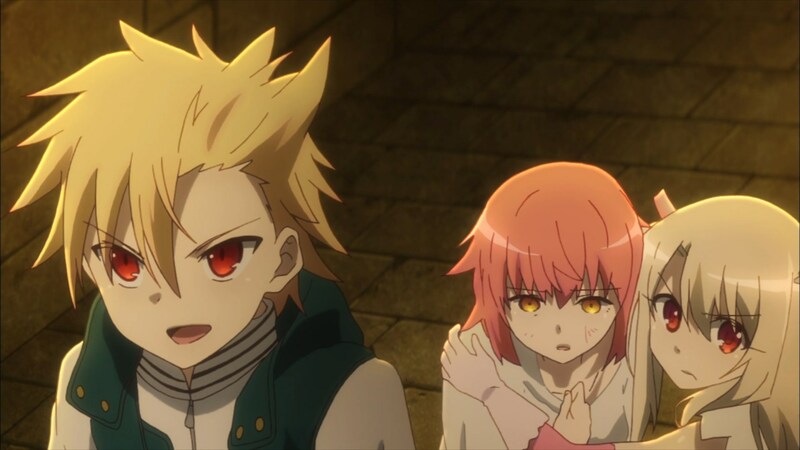 Finally, I’m glad to see Kuro and Bazett return. I might have missed that little scene after the end credits as I normally don’t watch previews in order to not be spoiled. However, the time left after the credits caused me to take a chance. I’m glad I did. 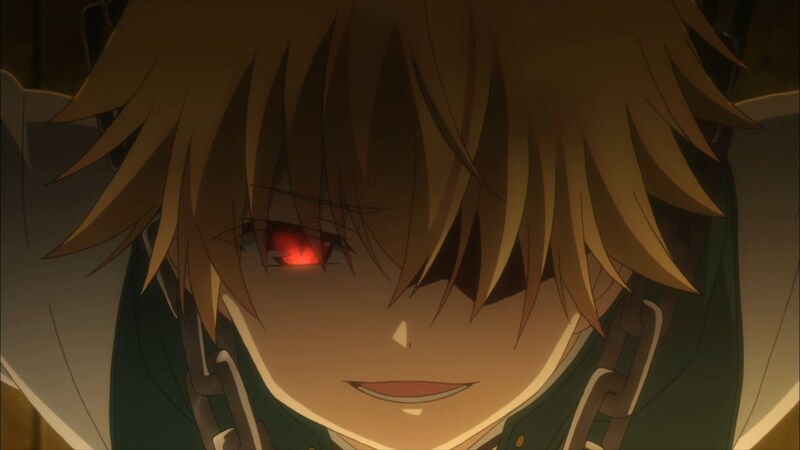 With Kuro and Bazett back, combined with a magic girl Ilya and Gil-kun, our good guys might have a bit of a chance. Now we just need Sapphire, Rin, and Luvia to show up. 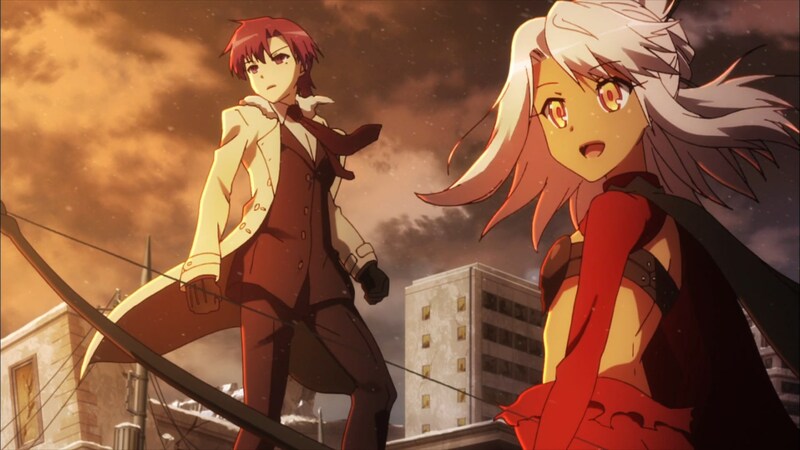 In the end, Fate/kaleid liner Prisma Illya 3rei!! 03 is a very enjoyable episode that shunned fanservice (I didn’t consider what happened to Tanaka to be done for fanservice) and comedy for pure action and plot. So far, Fate/kaleid liner Prisma Illya 3rei!! 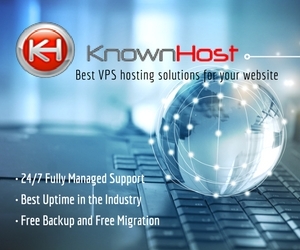 is proving to be every bit as good as I’d hoped it would be. 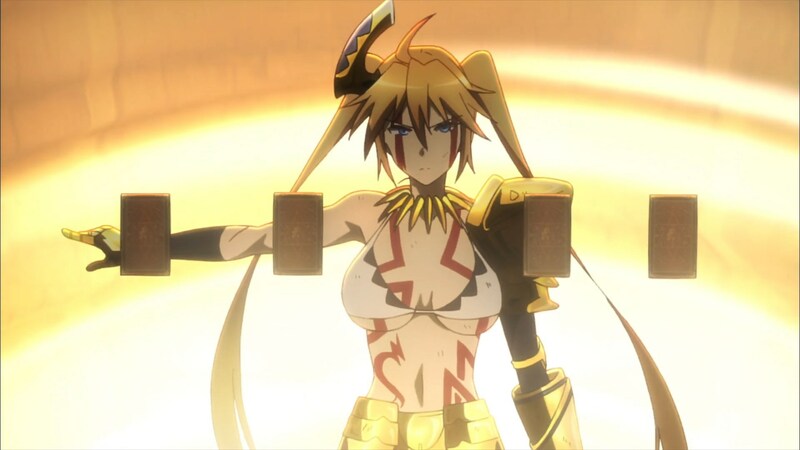 I doubt Thor is a berserker card, the Nasu verse seems incredibly restrained in that aspect. Their are Demi-Gods like Hercules and Gilgamesh, but they’re still human. The card is probably the frost giant that stole Mjolnir, which is a prominent tale itself. That being said, I broke with tradition since the two MEGA Fate franchise fans with knowledge out the wazoo are no longer around. 🙁 As such, I looked and Beatrice apparently does have a Thor Berserker card. I didn’t see much beyond that, but apparently, she’s wearing some of Thor’s clothing when she does an install of the card. Well, Thor is a Norse god, i.e. the cultural sphere where the word ‘berserker’ originates. A tenuous connection, but it’s the strongest there is. I can’t remember anything from the Sagas where Thor went berserk but it’s not impossible – he was quite impetuous in his youth after all. Well, other than the Gilgamesh Archer Class Card, the others had their personalities messed up somehow when their cards became people. So maybe that’s how Thor is Berserker. Though all of the cards could have been Berserker in my opinion. Or, since this is an alternate universe, maybe Thor was a nutter. I’m just grasping at straws. Again, the cloth is NOT Vimana. It’s something else, and it actually possible to guess what it is if you account for Nasuverse’s penchant for… modifying myths. I thought that’s what they called it in the anime. Update: I made a quick edit. Two possibilities about Illya conveniently finding Ruby. 1. 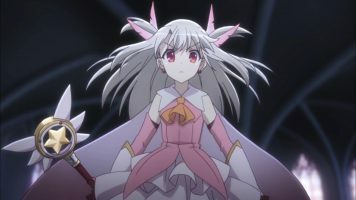 Remember Illya has exceptional luck in this series as a result of being a Lesser Grail- her absurdly lucky evasions of Kuro’s attempts to assassinate her at the beginning of 2wei testifies to that. And luck is a stat in a Nasuverse that has actual effects. Finding Ruby the very first time round is a result of this luck. 2. 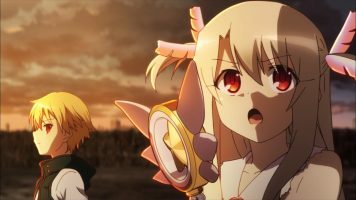 As a Lesser Grail, Illya might have wished Ruby into her hands when she desperately charged at Beatrice while wielding a Random Mystic Code This is a case of a Lesser Grail granting her own wishes in desperate circumstances – something Fate/Prisma allows. We’ve seen this once before with Kuro, and summoning Ruby is probably much more modest as a wish comparatively to that feat. It stacks up nicely with your theory that Darius Ainsworth recognized that Illya is a Grail. If Illya indeed used the wish-granting properties inherent in her nature of being a Grail to summon Ruby, it’s possibly Darius Ainsworth detected it. Gil can outplay Angelica but only as long as he keeps her too hot headed to do anything else than hur durr blade spam. Kinda funny that it mirrors the Shirou&Gil final battle on UBW, if Gil werent derping full time he would have slaughtered Shirou with a perfect, Reality Marble or not. And yes Vilmana is the space ship, not the camo cloth. The cloth is Hades’s Cap of Invisibility also called Cloth of Concealment. Yeah, I fixed that. I’m not sure why I am thinking that they used that term for the cloth.